Last weekend we went on a little adventure trip in the woods across my house. I had never really been to this part of the woods but when my little sister said there is a big, BIG pond over there I had to go. So we went on this gloomy sunday morning. Nobody ever really comes in this part of the woods and so the fallen leaves had covered the whole trail and we had to guess which way to go (Hey, the trees are more apart here, I think the trail goes this way!). After stumbeling up and over various trunks I spotted the pond in the distance. Yay! We made it. I swear, It’s like my own little lake Michigan, practically in my frontyard! No, I did not tackle the woods in these heels. I brought them along in my purse and switched my footwear on the scene. I know, I’m a (blogging!) girl, What can I say? Although they are pretty high heeled they are really comfortable to walk in and I love them. Tee hee, it cracks me up to imagine you hiking in those, even though you said you didn't. Anyway, that looks like a gorgeous place to go! I want to find somewhere like that around here. What a cute outfit, and those heels and absolutely adorable! Also thanks so much for taking the time to check out and comment on my blog! Hope you keep coming back! Haha, I love that you brought a change of shoes – you're definitely a blogger 🙂 Very cute outfit, love the color of your skirt. And how awesome that you're so close to such a beautiful area! Those tights are amazing! And the lake is incredible! I loooove the colour of these tights. Very cute outfit! The color palette you chose here is stunning! And I love that you admitted to a little shoe switch. it's always such an issue, trying to be practical (walking shoes) but fashionable (not very appropriate walking shoes). I love the ones you chose! 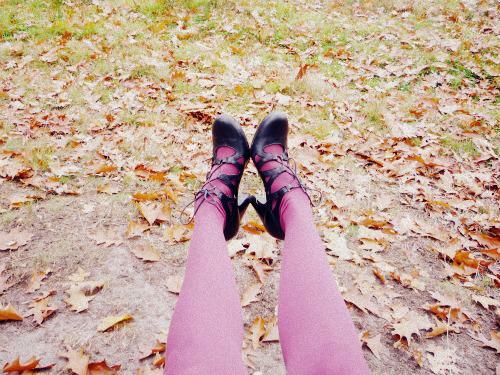 so autumn, love your outfit so much dear. What a beautiful setting. And the color of those tights with that mustard skirt is wonderful! That sounds like quite the adventure, and you did it in a stylish outfit too! I love the mustard skirt paired with the colourful tights. I need to stock up on some this season!! 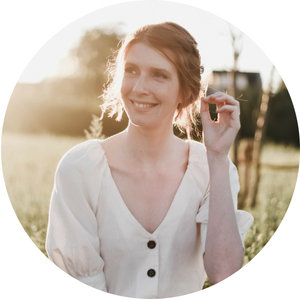 Thank you so much for visiting my blog, and I'm sorry it took me so long to stop by here! 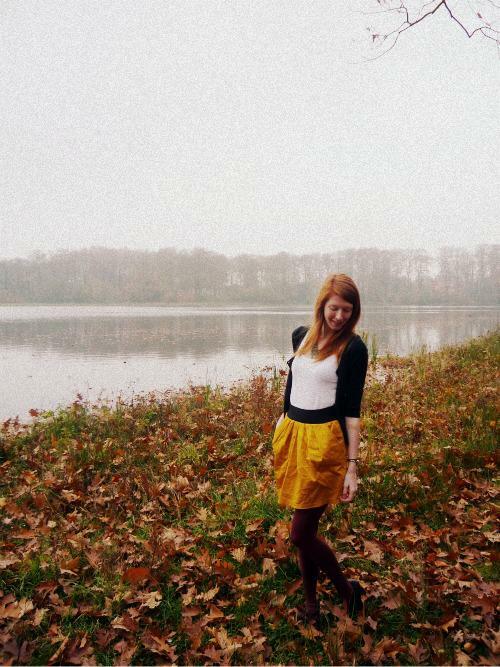 I love your mustard skirt…and that photo location is gorgeous! 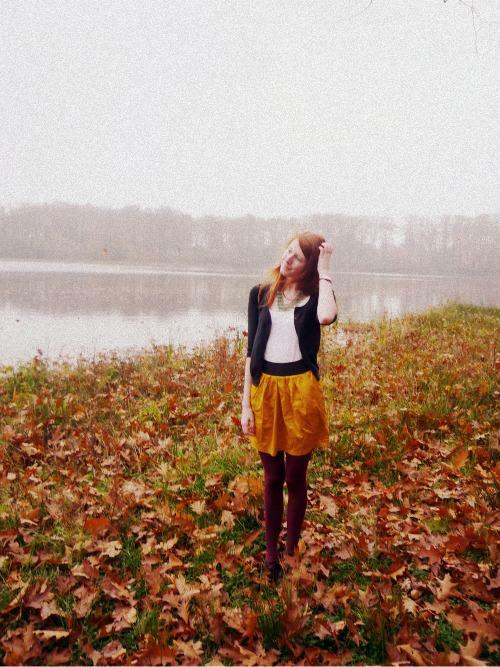 Love your mustard skirt, and the trip through the woods was totally worth it, the lake looks so pretty covered in fog. Such a cool place to take pictures! I really love the mix of yellow and purple in your outfit too. Very pretty! What a cool little adventure! I love exploring, too. And your shoes are fabulous. You dress so lovely!!! I love your blog 🙂 and the pics! I am a new follower! The swap is an excellent idea, hehe 🙂 You look amazing, and I love the quality of these photos!! wow it looks beautiful!! Love the leaves everywhere, very very pretty.